Wait, what constitutes Project Based Learning in Math? ; the Non-Negotiables of Math PBL. Let me preface this post by saying I am an unabashed fan of Jo Boaler. I’ve recommended (and even given as gifts) her book What’s Math Got To Do With It?. Let me also state that I work for (and love) the New Tech Network, a model of education that employs Project Based Learning. With those two factoids in mind, I’m having a hard time circling the square of what is Project Based Learning in Mathematics? What are the non-negotiables? What are it’s defining characteristics? What is the end result? I ask these questions due to the following passage from the aforementioned “What’s Math…” book from before, regarding an example of Project Based Learning. A farmer has thirty-six individual fences, each of them one meter long, and he wants to put them together to enclose the biggest possible area. Now, I love this particular mathematical task. It’s straight-forward, has multiple entry points, several possible solution routes, potential for extension, potential for hands-on activities. You know, everything you look for in a good mathematical task. But is it a project? Personally, I’d describe this as more of Problem Based Learning, about which I’ve written some. In my head, a Project Based Learning unit takes several weeks, incorporates a multitudes of skills and knowledge bases, and results in a a robust final product that may take days to actually complete. Examples of end products: articles, podcasts, videos. This task probably takes a class period or two, incorporates a few skills and the final product is the problem solution. Then again, perhaps I’m a bit too inflexible in what constitutes a Project versus a Problem. Perhaps PBL isn’t necessarily about the complexity of the task, but in the way that it’s posed and facilitated. The task kicks off the instruction. The students have to grapple with the task without pre-loaded instruction. The facilitator has to be nimble and knowledgeable enough to coach kids through a task when struggles come up. Is that it? It certainly appears so on a first look-see. Maybe even here though, I’m getting too lost in the weeds of PBL vs. PrBL. 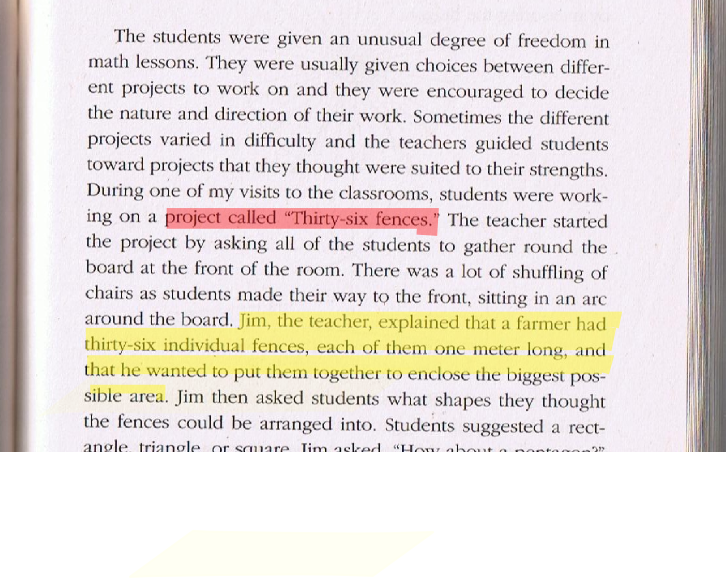 Maybe this is simply what good math instruction looks like, end-of-story. Previous Entry:Underground parking spots cost $30000-$50000 to build in D.C. This smells like a systems problem.